This casserole looks fancy (thanks, phyllo!) but it actually comes together pretty quickly, in spite of the longish ingredient list. The outside is buttery and flakey, and the inside is creamy and cheesy, a perfect match. 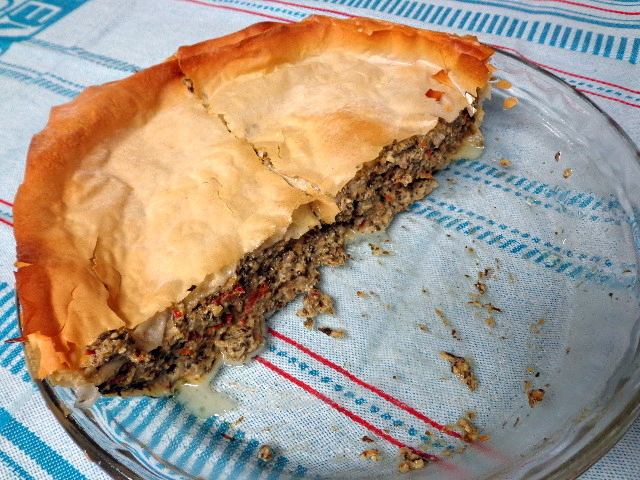 The mix of mushroom, lemon, and sun-dried tomato in the filling gives it great umami. I did not find the need to keep my phyllo covered with a wet towel while I worked with it, but make sure to thaw yours following the package directions. Warm 1 Tbsp evoo in a large pan over medium-high heat. Sauté mushrooms, spinach, and sun-dried tomatoes for 10 minutes, until the mushrooms have softened and the spinach has fully thawed. Stir in salt, oregano, and lemon juice and remove pan from heat. Use a food processor to combine the tofu, feta, and cheddar. Add cooked veggies and process until the mixture is homogenous. In a small bowl, stir together melted butter and 2 tsp evoo. Set up phyllo dough according to the package directions. Use a pastry brush to wet the bottom and sides of a 9-inch pie dish with the butter mixture. Brushing on the butter between layers, place 4 slices of phyllo dough into the bottom and up the sides of the pie dish. Spread the filling into the pie dish, smoothing the top so it’s level. Top with remaining layers of phyllo dough, continuing to brush butter between the layers. Use kitchen shears to trim off the excess phyllo dough that is hanging outside the edge of the pie dish. Bake for 30 – 40 minutes. The filling is safe to eat raw, but the longer it cooks the firmer it gets. Cook for 30 minutes then check regularly and pull out of the oven as soon as the phyllo dough threatens to burn (you want it to get a light tan; pull from the oven as soon as any dark brown spots appear). Allow pie to cool and set for at least 20 minutes before slicing and serving.